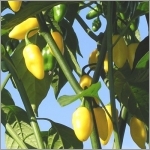 Originally from South America, Capsicum cayenne is now used worldwide as a food and spice. Plant grows 2.5-3 feet tall by 18-24 inches wide. The fruit is used medicinally. It is in leaf all year, simple oval, lance-shaped leaves. Bell-shaped, white to green flowers appear in Spring and Summer, and are followed by the fruits. The fruits are 4 to 6 inches long by 1.5cm in diameter, maturing from green to red and are often curled and twisted. The fruit has a thin wall and is ideal for drying. 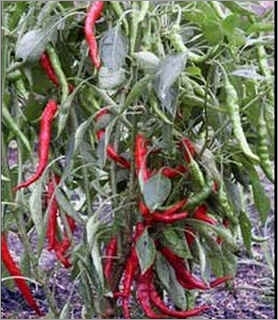 Cayenne Pepper is a medium hot pepper which is a very popular international favorite. Hot 30K-50K (Scoville Units), 10 times hotter than Jalapeno. Cayenne interesting flavor makes them popular fresh, cooked or pickled. Matures in 73 Days from setting out of transplants.